Where Parallel Lines Meet was the title of a panel Poetry Flash did at the Associated Writing Programs conference in Chicago in 2009; on it were poets Nickole Brown, Rusty Morrison, Charles Harper Webb, and Matthew Zapruder; I was the moderator. The panel question as posed to the public was: "American poetry has split into a bewildering number of styles that can be as different as Language poetry and Slam poetry. How do our poetries relate: disdain? benign neglect? Interest? Cross-fertilization?" Our original proposal to the AWP panel board said: "Our audience for poetry is woefully small. Smaller, in truth, because innovative poets tend not to read mainstream poets, New York School poets tend to read their own, and so forth. It's essential to the health of our art to open discussion, to breach the boundaries. That has been the mission of Poetry Flash across its decades, and that's the aim, the holistic impulse, that drives and gives merit to this panel proposal." As it fell out in the hectic, crowded schedule of all AWP conferences, our hall was right next door to a panel for the just-published Norton anthology American Hybrid, edited by David St. John and Cole Swensen—a publication with a justifiably big buzz, dealing with contemporary poetic creation across what had in the 1970s, '80s, and into the '90s been the war lines between Language poetry and other associated experimental movements and the mainstream, what the experimentalists used to call "the Poetry Establishment." So our two panels were deeply relevant to each other, but conference-goers had to choose one or the other. We did our best to remedy that fact by plugging American Hybrid several times in the course of our discussions. The following are the responses of some of the panel members to the question. This past week, I was at Tall Rock Retreat, snugged away in a cabin in the mountains of Vermont, and I had a lot of time to think about this topic, not only in terms of what I spoke about two years ago at AWP but where I am now. Like any retreat, what I read was like the current carrying my little raft along, landing my imagination (and sometimes the tilt of my own work) on strange and distant shores. At the top of the stack was a required text—Helen Vendler's The Art of Shakespeare's Sonnets—for my participation as faculty at the next Murray State residency. A slightly Bodleian tome, this was a switch for me; in the past few years, I'm ashamed to say, I rarely venture pre-Marianne Moore and shop right from the pages of Rain Taxi. Not a bad strategy, but still. An immersion in the now of anything can, after a point, distress and narrow, allowing the mind to conjure up full-on battles from petty grievances. In the small world of poetry, made even smaller by my work in publishing, this is a particular danger. All this, of course, is a highfalutin way of saying that the whole deal hinges on chemistry, particularly on the expectation of the reader and the intent of the writer. The best reader a poet can hope for will put on the right gloves for the work ahead, but they won't ransack the place for meaning either, allowing whatever experience intended to be, well, experienced. And the poet? The poet fares best with both a willingness to split wide open and to get out of her own way, especially when it comes to fretting over control over what a poem is before it actually is. If the poet's anything like me, she won't have any idea what she's doing except taking a deep breath and diving into that black water, which is to say I'm too busy doggie-paddling away than worrying about which school I might be swimming with. Besides. I agree with David St. John, in his introduction to the recent Norton American Hybrid anthology when he refers to the notion of the "poetic school" as "an anachronism, an archaic critical artifact of times long gone by." (xxvii) I'm not sure if fifty years qualifies as "times long gone by," but he's right: we are no longer feeding ourselves exclusively from packs of poets roaming our coastal cities, all published by a few central hubs of enlightenment (and generally all tangled in various personal and sexual webbery). This is not to undermine the distinct differences between poets—they do still exist, and for good reason. It does mean, however, that the bounty of independent publishers over the past twenty years alone proves a rapid diversification, and with the proliferation of online e-zine and discourse about poetry, a writer need not slap on a name tag but simply step up to the buffet to pick and choose what is needed to form (or shatter the form of ) poetry. And surely anyone navigating through the bio-dome atmosphere of AWP can see there are simply far too many of us now, about 8,000 at the last conference, all organized under one roof.…No, there are far too many to be sequestered into any tidy grouping. The important message is not just one of cross-fertilization, but that as a writer, any poem I craft is attempting to communicate, not just with myself, but with a reader. And that communication is not always structured with the same intention—how close I actually want to be to that reader and how I might get there might vary from poem to poem. Even though I'm primarily known as a narrative poet, with my first book being a novel-in-poems, there are times when it's vital for me to embrace the distance associated with Language poetry to achieve the cognitive dissonance needed. (For me, this means sometimes breaking the signifier from the signified, using a word until you loose it entirely, sending those missiles into meaning to see what might eventually fire back.) While I often lean towards poems that have a clear emotional pulse, I also realize that the story that needs to be told first must be excavated, so there are often pages and pages of experiments, free associations, diagrams, lists, erasures—whatever it might take to get me to where I need to be. And the poem itself dictates where it needs to go, not me. This is something I always have to remind myself, but nevertheless, I can't help but squirrel away elements of not only different kinds of poetries but also different genres (fiction, nonfiction, and spam included). Who knows what tools I might need to get a job done? If there's room in the toolbox, I'm keeping anything I find useful. what is inside of her out. Nickole Brown will begin teaching at the University of Arkansas, Little Rock, in fall 2011. Her recent book of poems is Sister. She is also the co-editor, with Judith Taylor, of Air Fare: Stories, Poems, and Essays on Flight. As you can probably tell from my work, I am very interested in formal constraints—and the ways that limits create new, unexpected opportunities. In these poems, I used "please, stop," and "please advise," as the only endwords in the poems. Operating under that constraint focused, and enabled the poems about my father's death in ways that I couldn't have predicted. But I write in many styles, in many forms, with the hope that each new project will help me explore and expand the ways that language can act upon me, and open my consciousness. I experiment so as to disrupt my usual language patterns in order to open the framing devices of my consciousness. But even experiment can become a pattern that limits one's potential. It is easy to become complacent about what I think a poem can be or do. One of the best ways to challenge my own writing is to read as many divergent styles of poetry as often as possible. To use the language of this panel's title: I would say that it is essential that I regularly leap off of the parallel of the kind of work I find most agreeable, and read off the track. I think that the place parallel lines meet is in the readers and writers who let their minds tangle with the tangents. Giorgio Agamben, the Italian philosopher and literary theorist, in his latest book of essays, proposes that whatever belief systems we use will stop being useful to us as soon as we grow complacent within their tenets. At that point, we begin to be used BY the belief system, rather that be able to use it to continue to learn and grow as thinking acting beings. Agamben describes our society as having lost the ability to make "use" of so many of the systems and beliefs that dictate our lives, explaining that we live instead within a "museification of the world" (p. 83). To thwart this separation from true engagement, this loss of agency, he advocates "play." He suggests that we play, as a child does, using whatever might be available to us, and that, like a child, we don't worry about rules governing its use or the end result of our play—we simply let our senses and intuitions guide us. He calls this the act of profaning. I think this is a helpful idea to keep in mind when we read poetry that may come from a paradigm that might seem antithetical to our own practice. Rather than reading within our frame of desire and expectation, we can read profanely, open to pleasuring in the instance-by-instance gratifications the poems provide. Allowing myself to be immersed in all types and styles of poetry—especially those that may at first seem antagonistic to my own style of writing—helps me to continue to re-assess, to bring a fresh eye, to the work that I am most deeply invested in. And, I can stay more conscious of my own practice's limitations. I'm not suggesting that I would want to read without discernment, but instead, that I want my faculty of discernment to be ready to evaluate itself, as it articulates differences. And, that continuing to discern and appreciate the differences, even as I open to registering any kinds of enjoyment, allows me as a reader to constantly challenge my personally acquired prejudices about poetic practice. I also believe that being open to profaning one's formal prejudices keeps me generally more limber in the process of learning to step out of other prejudices and stereotypes that constrain me. That's a larger claim than I can substantiate. But studies in neuro-science have certainly shown that the brain's cortex categorizes, and the neural paths we build become wider and harder to disrupt the more we practice them. But practice in directive and open awareness helps us question these modes of thinking by bringing us back to the present moment to experience life anew and in different ways. And we can see this appreciation of variance in many of our current poets and poetries. There are so many writers willing to play, or I'd say "profane," the limiting parameters of the camps of poetic style. The new Norton anthology titled American Hybrid, edited by Cole Swensen and David St John, demonstrates the freshness of this approach. I'm sure many of you read Cole Swensen's illuminating essay in the Writer's Chronicle (February 2009) which is one of the introductory essays to this anthology. As this volume purports, hybridity is flourishing. And, keeping ourselves aware of the ways that these hybrids disrupt our own expectations will allow us to become more agile in breaking such frames in all forms of our thinking. I'll end by restating a truism—that the best poetry or prose does not follow prescriptions, or fit in traditional categories, but rather that it deflects the more simplistic generalizations we might make about them. Upon poems like this, our expectations bounce back at us, forcing us to reappraise our own devices of appraisal. Rusty Morrison is the author of Whethering, winner of the Colorado Prize for Poetry, and the true keeps calm biding its story, winner of the Sawtooth Poetry Prize, the James Laughlin Award from the Academy of American Poets, and the Northern California Book Award in Poetry. Her forthcoming book, After Urgency, received the 2010 Tupelo Press Dorset Prize. 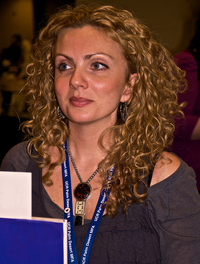 She is the co-publisher of Omnidawn, based in the San Francisco Bay Area. She is a Poetry Flash contributing editor. Of the "bewildering number of styles" into which American poetry has split, I'd guess I'm linked most closely with the Stand Up kind. The term "Stand Up Poet" was coined by Gerry Locklin and Chuck Stetler, referring to Edward Field, whose book Stand Up, Friend, With Me upset the poetry establishment when it won the Lamont Prize in 1963. Field was and is a prime practitioner of the style exemplified in Stand Up Poetry: An Expanded Anthology, which I edited for the University of Iowa Press in 2002. I call this poetry "Stand Up" for its use of humor, as in stand up comedy; for its performability, as in stand up and perform; and for having the qualities of a stand up guy: courageous, straightforward, trustworthy. In the anthology, I list ten characteristics often found in Stand Up poetry. Besides humor and performability, these include: 3) Clarity; 4) Natural Language; 5) Flights of Fancy; 6) A Strong Individual Voice; 7) Emotional Punch; 8) A Close Relationship to Fiction; 9) Use of Urban and Pop Culture; 10) No Taboos. A poem doesn't need to score a perfect ten to be Stand Up. Six or seven may suffice—especially if humor and/or performability are there. I didn't list Accessibility—a term unjustly turned toward the pejorative. But poems with Stand Up qualities lean toward the reader-friendly, and away from the opaque. Stand Up poems lend themselves to performance (I've been told that a number of poems in the anthology have done well in slams), but Stand Up is not performance poetry, which like the script of a play, is at its best only when performed. 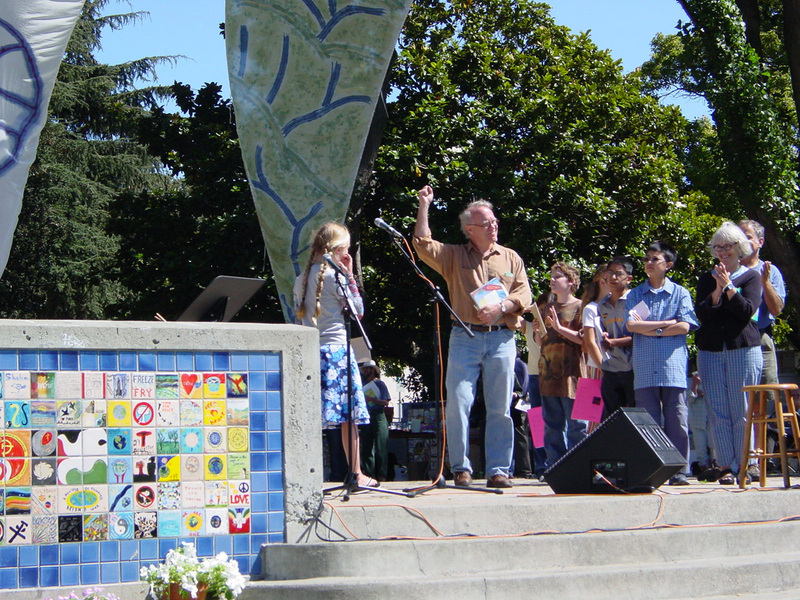 Stand Up Poetry is written for the page, but also works well on the stage. Stand Up has never been an organized school of poetics, nor do Stand Up poets write only Stand Up poems. Fewer than half of my own poems would qualify. Still, I'm a strongly reader-centered poet. Critical theory aside, I believe that meaning and clear communication are both possible and desirable. I hope to entertain and, possibly, enlighten readers, as other poets have entertained and enlightened me. Right now I'm especially drawn to poems of wild imagination and unexpected associations. I'm fascinated by the unconscious mind. I want to give readers new experiences, not just to help them re-live old ones. I like to satirize and celebrate—sometimes both at the same time. I'm drawn to investigate, and sometimes celebrate, "ugly" emotions: anger, vengefulness, envy, selfishness, schadenfreude. Why celebrate only "nice" things? I love energetic poems that boil, seethe, flash, or shimmer on the page. I made my living as a rock singer/guitarist for years, and approach my poems—even the sad ones—with rock-and-roll fervor. Too many poems lie on the page as if they've been chloroformed. Humor is also a great way to deal with postmodern concerns—slipperiness of language and identity, tendency of statements to deconstruct themselves, etc.—while not driving the reader catatonic. Comedy, I state in Stand Up Poetry, "is ideally suited to capture the absurdities, enormities, and pathos of modern life." It's compatible, too, with deep emotion and tenderness—areas I continue to explore. I enjoy poems in fixed form, and even write a few myself. I've never competed in a Slam, though I've had several students on the CSU Long Beach Slam Team. I applaud their energy, and warn them that improving the literary quality of their poems probably won't help them win Slams. I'm not much interested in so-called "experimental" poetry; but I believe that every first-rate poem is an experiment, trying to go "where no man [or woman] has gone before." I'm interested in the ideas of L*A*N*G*U*A*G*E poetry and its offshoots, but less interested in the poems. I'm not convinced that human minds work the way L*A*N*G*U*A*G*E theorists think they do. Strategies of monotony and repetition don't kick my mind into new ways of reading or perceiving. Boredom does not enlighten me; it drives me away. Nor am I interested in doing more than the usual co-creating with the poet. I'm well aware how commerce co-opts language, but don't believe that being hard to understand is the best way to counter this. Still, I could be wrong, and certainly don't begrudge other poets their interests or experiments. I'd love to see a larger audience for poetry, and believe that the kind I espouse is more likely to attract it; but I no longer believe that poetry will become even one-tenth as popular as rock-and-roll. I like poems that generate momentum, and hit hard. I like poems that crackle with energy—even despairing energy. I don't like poems that droop with world-weariness. I like to hear voices I've never heard before. I like to see from fresh perspectives, through fascinating eyes. I like poems that renew not just the language, but the world. Imagination is an end in itself. I don't like poems that won't risk meaning. I don't like poems that ring my doorbell and run. I don't like monotonous poems, even when the one note is a good one. I don't like poems that use their lines like well-made bricks tossed at random on a lawn; these poems never get off the ground. I don't like poems that want to show off more than they want to talk to me. I don't like poems that think they're better than me. I like to be swept up, carried away. I don't exactly like to cry, but I like poems that make me want to (unless it's from frustration). I like to be moved. I like to be entertained. I read for pleasure; struggling rarely pleases me. I'm willing to work hard reading a poem, but what I get out of it must be worth more than the effort I put in. I want a fair return on my investment. I don't like obscurity for its own sake—or, normally, for any other's. I like language masterfully used: "the best words in the best order." Great language is necessary but not sufficient for great poetry. I like words that are fun to say. I don't believe that "progress" occurs in poetry, but I try to write as if it does. I care more about progress in understanding the human psyche than in technical "advances." I shy away from writing called "experimental"; the term usually sticks to failed experiments. All good writing is experimental. A poem is like the proverbial shark: if it stops moving forward, it dies. Also, a strong one can eat you alive. The cardinal sin of poetry, and all art, is to bore. I try to follow the Golden Rule, and write for others as I'd have them write for me. and fresh strawberries with vanilla ice cream. Kickbox three days a week. Stay strong and lean. Shakespeare, Twain. Collect Uncle Scrooge comics. as you can. Wish them as well as you're able. away. Let your insurance handle it. Never drive drunk. you're tone deaf, own Perlman's "Meditation" from Thais. Don't look for hidden meanings in a cardinal's song. Don't think TV characters talk to you; that's crazy. for sea snakes. Smile for the camera. Don't say, "Cheese." Charles Harper Webb is the author of numerous poetry collections, including Reading the Water, Liver, Tulip Farms and Leper Colonies, and Shadow Ball: New and Selected Poems. He has received the Morse Prize, Kate Tufts Discovery Award, Pollack Prize, and Benjamin Saltman Prize, also a Whiting Writer's Award and a Guggenheim. He directs the MFA in Creative Writing Program at California State University, Long Beach. American poetry has split into a bewildering number of styles that can be as different as Language poetry and Slam poetry. How do our poetries relate: disdain? benign neglect? interest? cross-fertilization? The panelists, widely spaced within the poetic sphere, will each read one of their own poems and then offer a personal response to the question, opening discussion among panelists and between panel and audience. My first thought was to wonder, are we in fact in a time of more different styles of poetry? Or are we just able to more easily read them, because of the internet and the relative inexpensiveness of publishing books of poetry and anthologies? That's a pretty impossible question to answer, but I do think it's true that we are in a funny time in American culture, when a deep (and often self-congratulatory) suspicion of marketing and naming and hype coexists with an anxiety on the sense of artists that it is in fact absolutely essential to market and name and hype oneself, in order to stand out in the cacophony. During the actual talk at the conference I was referred to by various participants as an experimental poet, as well as a "neo-surrealist." The former designation made me laugh, because I do not think of myself as an experimental poet, nor am I in any way thought of by the people who consider themselves to belong to that group as one of them. 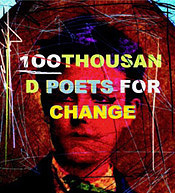 My poems too often rely on a speaker or narrative, without in any way particularly concerning themselves with disruption of the egotistical sublime. My interest in literary theory was sated during my graduate studies in Slavic Languages and Literatures at UC Berkeley in the early 1990s. I believe one can have a self in the poem, and that self can express itself openly and generously and actively, without inherently becoming a false dominating force. The latter designation, of "neo-surrealism," (which I think was meant as a compliment) made me feel a little ashamed but also proud. Like a lot of poets, I will occasionally stumble into surrealisms gladly, but my work is for the most part not surrealistic. Nor am I as brave and committed as the surrealists were. But I greatly admire the surrealist impulse and the courage of its practitioners, so I feel both proud and also completely unworthy to be in any way associated with a group that includes Robert Desnos. It was much easier for me to think of a personal response to one of my own poems. The poem, "For You in Full Bloom," is basically one in which a speaker tries to describe how he is feeling. In the course of doing so he thinks about a park, and that thinking leads to other thinking. Someone has left. He sees things out the window. He thinks about the city he is in, and who has built it. It definitely has a single consciousness speaking in a particular situation, though that consciousness is quite willing to think (as we all do, all the time) about a lot of different things, and drift around the city a bit, visualizing places that it can't necessarily see from its literal place where it is at the moment of writing. If a reader or critic felt the desire to engage with this poem, I would hope that person would try to talk about (beyond the very obvious things I have mentioned above) certain formal aspects of the poem—such as its lack of punctuation, certain instances in which the speaker describes common objects from the world as if he has never seen them before, and so on—that have an effect on a reader or listener, and are also, like everything in poems, characteristic of larger aesthetic tendencies in the world of poetry and beyond. William Carlos Williams wrote the poem is a small, or large machine made of words. I have always considered that to be a very fine and wise beginning. For me the poem is a machine primarily designed to produce in the reader certain feelings I find impossible to name in any other way. It is my hope the machine of this poem will work for you. Some of you might feel connected. Others may not. Perhaps you will find the poem too new-fangled, conversational, slightly surrealistic, even though whatever surrealism or imagery there is for me is merely an acknowledgment of the imagination we are all constantly in our own ways always experiencing. Or you may find it too old-fashioned: after all, to be sitting at one's desk, remembering and thinking, is one of the oldest and most familiar things for a poet to do, and probably no one will ever do it better than Coleridge or Keats. I'm either too young for American poetry, or too old. There is either too much imagination, or not enough. I'm either telling too much of a story, or not enough of one; the imagery is either too familiar or completely invented and not connected to "real life experience." As Wallace Stevens said, "To make a clam play an accordion is to invent not to discover." Maybe I would like to be Keats, feeling like a clam filtering the great mysterious waters of the sea through the little sieve of my mouth, playing the accordion in the sun. 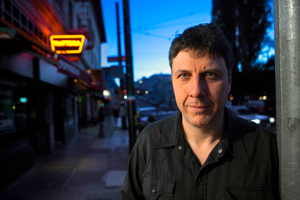 Matthew Zapruder is the author of three poetry collections, American Linden, The Pajamaist, and Come On All You Ghosts. He has received the William Carlos Williams Award from the Poetry Society of America, a Lannan Literary Fellowship, and the May Sarton Prize from the American Academy of Arts and Sciences. He also co-translated, from Romanian, Secret Weapon: Selected Late Poems of Eugen Jebeleanu. A collaborative book with painter Chris Uphues, For You in Full Bloom, was published in 2009. He lives in San Francisco.